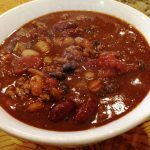 I love all types of chili and this Smokey Chipotle Chili is a favorite (all chili is a favorite for me right?) Love the new flavors this introduces, I bet you will too! In a large pot over medium heat, add 2 tablespoons olive oil, & the onions. Saute the onions until soft, stirring occasionally about 4-5 minutes. Add the garlic, saute about 30 seconds until it just becomes fragrant. Add the ground beef, chorizo & chipotle pepper and saute until the meat is browned. Add the spices to the meat mixture and toast the spices for two minutes, stirring them frequently. Toasting the spices will enhance their flavor. Add the tomatoes and the beans and bring the pot to a boil, reduce to low, cover and simmer for one hour, stirring occasionally.